It has been ages since I have blogged any of my recipes. I have been very busy entertaining my dad and a guest. Dad is already in Dubai and hopefully enjoying his stay there. I have been very busy in the kitchen and loads of recipes are waiting to be blogged. I was suppose to blog the recipe for sukhadi or golpapdi during Navratri but got all caught up between dandhias and saris. Yeah you heard right saris as at this moment I don’t own a single chania chori outfit! Every time I watched mum, kaki, Vibha bhabhi make sukhadi, I always felt that this is not for me… what if it becomes too hard, what if it does not set etc etc. No one could give me the exact time to let the jaggery caramelise. However, came across this very easy Tarla Dalal recipe and added a few of my own things and voila a delicious easy recipe for sukhadi. 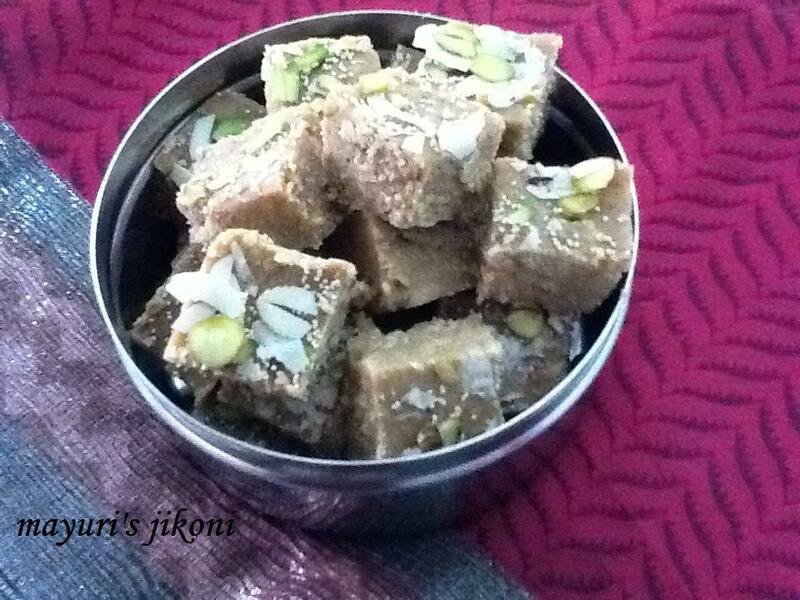 My grandmother and mum’s favourite, I too love sukhadi. Come to think of it which sweet dish don’t I like? I have no idea what the importance of making sukhadi during Navratri is. Does anyone know? Grease a tray. I used a 6″X 6″ tray. You can use a thali too. Melt ghee in a pan over medium heat. Add flour,chopped almonds and fresh ginger and stir fry it over low heat till the flour is golden brown. Immediately add the cardamom powder, saffron, coconut and ginger powder if using any. Add the grated jaggery and milk. Mix well. When the jaggery melts, pour the mixture into a greased tray. With the help of a small steel bowl or a spatula, spread it evenly. Decorate with the poppy seeds and almond pistachio flakes. Press it gently into the mixture with the help of a spatula or bowl. While it is still warm, cut into desired size and let it set completely. Remove the pieces slowly from the tray and serve. Can add a tsp of fennel seeds while roasting the flour in the ghee. The milk prevents the mixture from becoming too hard. If you like you can use a mixture of almond and pistachios instead of just almonds.